Bedding is the icing to most bedrooms. Comforters and pillows are soft, comfortable, lush and warm. Cleaning them is no easy task, which is why most people clean them professionally. Are you looking to save money on dry cleaning services but still want your dirty and dusty down comforter cleaned? Just like regular clothes, shoes, and toys, you can wash your comforter in the convenience of your home. Not only will you save money, but you’ll assure yourself nights of safe and clean sleep. 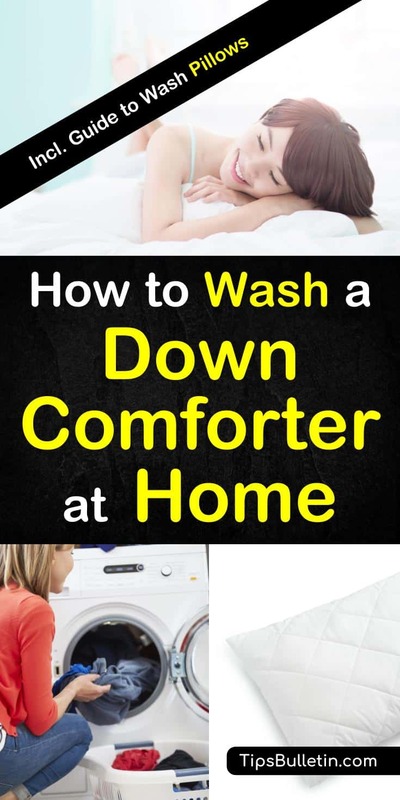 In this article, you’re going to learn how to wash a down/feather comforter at home, and how you can wash pillows at home. Can You Wash Pillows At Home? While you should have your comforter cleaned professionally every few years, this brings up a problem: it will probably become dirty before then. So you might want to consider washing it at home, which will save money and keep dust at bay. If you want to clean your down comforter at home, here’s how you’re going to want to do it. First, make sure to keep an eye on your comforter while it’s on your bed. Manufacturers use the feathers of geese, ducks, and other soft birds in down comforters, so if you’re finding feathers around, it probably means your comforter has a hole in it. Stitch up these holes when you find them, and while you’re at it, take the spot-cleaner to any small stains. Before you clean the comforter, check your laundry machine. If you have a front-loading, heavy duty washing machine, then you should be good. If you have a top-loading washing machine, you’ll want to consider taking it to a laundromat. Top-loading washing machines have agitators that can injure the comforter during the cleaning process. 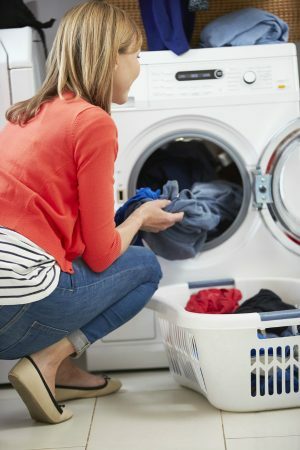 Even if you do have a front-loading, heavy-duty washing machine, check to make sure that the material sits comfortably inside; you don’t want it “jammed” in there. If you have the owner’s manual, check it for the recommended size. Otherwise, do a quick Google search of the make and model of your washing machine to find the manual online. Use a mild detergent and briefly run the machine before you put the comforter inside. Letting it run allows the water to mix with the detergent, resulting in a more thorough clean. Stick to the delicate cycle because hot or cold water can hurt the down. Double up on the rinse cycle, because comforters can absorb a lot of soap. If you think of it, interrupt the cycle right before the spin cycle and squeeze out some of the water, which will help lighten the fabric. For drying, pull out the comforter. You’ll notice that it may look flatter and smoother than usual. An unusual appearance is typical. If you’re washing a white comforter, the fabric might appear stained when you pull it out. The material will return to its regular white once dry. Consider letting the comforter air dry before putting it in the dryer, but make sure you have plenty of time to do so. Down takes a long time to dry, so you’ll want to stick it in a warm, dry place (out in the sun is ideal) and have plenty of patience. You’ll want to stay away from drying the comforter on a line because it can develop mildew. Move the comforter to a machine dryer once it has started to dry. Use the low heat setting so to avoid shrinking. Check while it’s drying, first and foremost to fluff the fabric, and secondly to check for any clumped down. Clumpy down means the down is still wet and needs more time. Last but not least, wait until the comforter is dry. Again, patience is key here. Depending on the heat level of the dryer, you could be looking at anywhere from 4 to 12 hours for the comforter to dry. Once it’s dry, stick it on your bed. Your down comforter is now fresh, clean, and ready for the evening. Yes. Pillows are just like comforters, and no matter how they appear or come, you can always wash them. Pillows attract dust over time and need cleaning. Start by removing the pillowcase (or sham). Additionally, inspect your pillow to see if there’s a zipper. Certain types of pillows have zippered cases that should be removed and washed in a separate load. Place them in your washing machine. Try to do at least two pillows at a time so that the load will be balanced. Note: Unlike with comforters, you can use a top-loading or front-loading washer, as pillows are lighter and smaller. Add the detergent. If your pillows are white, you can also add a mixture of dishwasher detergent, bleach, and borax to make your pillows shine white. Then, simply start the cycle and your washing machine will handle the rest. Unlike with comforters, you can use warm water. Consider sending it through a second rinse cycle, just to make sure all of the soap is leached out of the fabric. How you dry your pillows depends on their design. 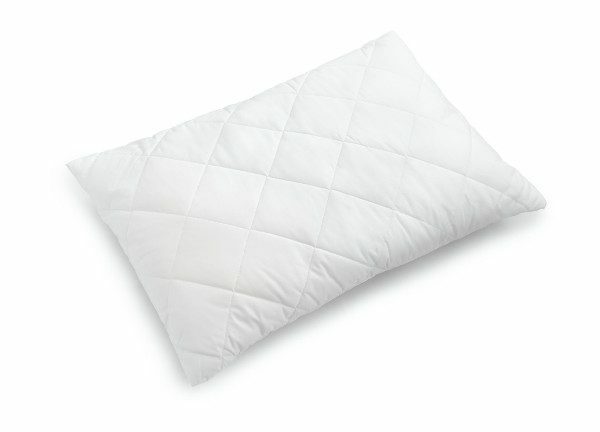 For down pillows: If you have down (feather-filled) pillows, use the air-dry setting. For synthetic pillows: the synthetic material can degrade in high heat, so use the low heat setting. Tip: If you have two clean tennis balls lying around, stick them in a pair of socks and throw both of them into the dryer with the pillows. Doing so will decrease the drying time and help to fluff the pillows. Once the cycle finishes, take care to inspect for any excess moisture. The last thing you want to do is stick wet pillows on your bed and have them develop mildew while your face is on them. Feel around for spots of dampness and smell the center to see if you can detect any moisture. If you do, put them back in the dryer. Otherwise, your pillows are ready to go. You can wash memory foam pillows, but please bear in mind that you’ll need to wash them by hand. Washing machines tend to be hard on memory foam, so manually cleaning them is the better option. Just like with regular pillows, remove the cases/shams. You can wash these in a machine as per usual, in most cases. Next, find a tub and fill it with enough warm water to inundate the pillow. You can also use your sink if it’s clean enough. Add liquid detergent like you would with a machine washer. You’ll want to add about a tablespoon for each pillow, so if you have two pillows, add two tablespoons. Use your hands to “agitate” the mixture. Work the soap into the pillow as though you’re giving it a massage. Squeeze and squish it. Make sure the material is getting a thorough treatment. When you’ve reached a satisfactory point, start rinsing. Bear in mind that the rinsing process will probably take longer than the washing process because you want to make sure remove any excess soap. Keep an eye on the water as it drains from the fabric, and even when it looks clear, spend a few more minutes just to be sure. You want to make sure you’re through. Avoid drying the pillow in a machine, because the high heat of a dryer can damage the memory foam. Instead, place it on a towel in a dry place. If you have the option to do so, leave it in the sun. Let the pillow to dry for a while, and before you bring it back to your bed, examine it carefully for signs of dampness. If there’s any doubt, leave it to dry some more. The last thing you want to do is put your pillow on your bed only to find out that it’s growing mildew. Washing your comforters, duvet cover and pillows is necessary if you want to have safe and clean living and sleeping conditions. While the task may seem to be difficult at first, you have seen how the right know-how and preparation makes washing your bedding an easy and stress-free affair. In this article, you learned how to wash a down/feather comforter at home. You also learned that pillows are washable, and you learned how to wash regular down pillows as well as memory foam pillows. Do you know someone who could use some tips on how to clean their bedding? Use the buttons below to share to Facebook, Twitter, and Pinterest.